Marvel Studios is continuing their streak of big successes at the box office. Amidst the seeming constant chatter of superhero and franchise fatigue, and with Hollywood bracing for what could be a less than stellar summer overall at the box office, Guardians of the Galaxy 2 has kicked off the season with a bang. After just a week of release domestically, the Guardians of the Galaxy sequel has already crossed the $500 million mark worldwide. According to Box Office Mojo, Guardians of the Galaxy Vol. 2 has, as of this writing, made $501.7 million at the global box office. 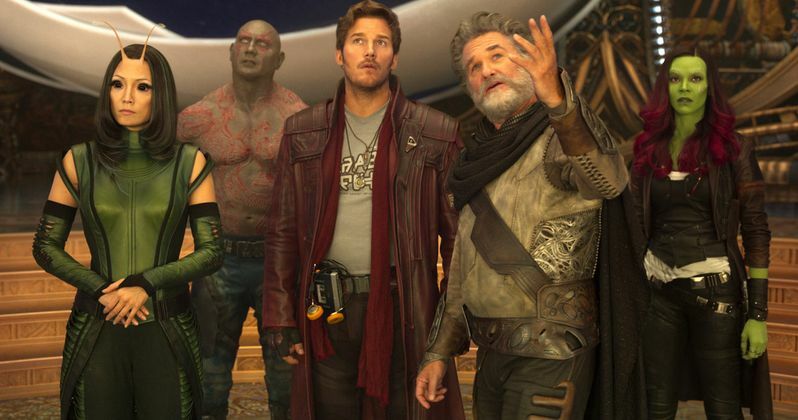 Considering that the first Guardians of the Galaxy, which was one of the biggest hits of 2014, grossed $773.3 million during its entire run, that is a very good start for Marvel's latest offering. At this rate, Guardians of the Galaxy Vol. 2 will easily best its predecessor and should be the latest Marvel Cinematic Universe movie to break $1 billion at the box office by the end of its run. If that does come to pass, it will be the fifth MCU movie to make $1 billion or more, with The Avengers ($1.51 billion), Avengers: Age of Ultron ($1.4 billion), Iron Man 3 ($1.21 billion) and Captain America: Civil War ($1.15 billion) all eclipsing that mark. The first Guardians of the Galaxy was a big surprise, considering that many pegged it as a big risk for Marvel Studios at the time, with many thinking that the studio was going to have its first flop. That was far from the case. Since the movie sort of snuck up on everyone, it opened the door for Guardians of the Galaxy Vol. 2 to do even better at the box office, because everyone is now familiar with these characters and is much more invested in their story. As opposed to wondering why a talking raccoon and a sentient tree were hanging out with one another in space. Even though the general consensus from critics seems to be that Guardians of the Galaxy Vol. 2 isn't quite as good as the first movie, it is still considered to be a solid movie. Currently, the sequel holds a very respectable 81 percent approval rating from critics on Rotten Tomatoes. For comparison, the first Guardians of the Galaxy has a 91 percent. However, the audience score for both movies is very close. While the first movie holds a slightly better 92 percent audience rating, Guardians 2 still holds a 90 percent, which is very good. And since it is the audience who determines how well a movie does at the box office, that is going to be more important as the movie heads into its second weekend domestically. The Guardians of the Galaxy sequel has already surpassed the overall grosses of The Incredible Hulk, Captain America: The First Avengers and Thor. By the end of the weekend it will probably be ahead of Ant-Man and Iron Man as well. Guardians of the Galaxy Vol. 2 should easily win its second weekend at the box office, with King Arthur: Legend of the Sword looking like it will be a major bomb and now other big releases in its way. This bodes very well for the future of the Guardians of the Galaxy in the MCU, with the characters set to appear in Avengers: Infinity War and Guardians of the Galaxy Vol. 3.